Basement dehumidifiers are widely advertised and heavily promoted but the term can be misleading as it is often used to cover almost any type which could be used in a basement. On this page I shall talk only about appliances which are specially designed for basements or are commercial models with similar features. These features include the ability to operate in low temperatures, excellent energy efficiency and robust, durable build quality. Choosing the best dehumidifier for your basement depends on your budget, the size of your basement and the temperature and humidity conditions inside it. To make your task a little easier I have carefully selected the top five basement dehumidifiers which I believe are outstanding in their class. If you are not sure whether you need one as good, and expensive, as those I recommend here just scroll to the bottom of the page where you will find links to a couple of other pages which may help you to decide. If you know what you need but are not sure which model to pick just take a few minutes to read through my recommendations. The descriptions are brief but at the end of each one is a link to my full review of that model which includes a summary of features and a full technical specification for each of the top 5 basement dehumidifiers I recommend. You will notice that my selection of the top 5 basement dehumidifiers is dominated by Santa Fe models. I make no apology for this. The Santa Fe range is made in the USA by Therma-Stor which is the number one company in this field with an outstanding track record. Most other brands are either made by Therma-Stor but sold under other company names, such as SaniDry, or are new arrivals on the market with little or no history on which to make a sound judgement about their quality. For a small to medium sized basement the new Santa Fe Compact 2 is ideal. The Compact 2 is a significantly improved version of the original Santa Fe Compact with a higher, 70 pints per day, water extraction rate and will control humidity in a basement of up to 1600 square feet. The unit is very small and can be installed almost anywhere. It can even be suspended above the floor, between floor joists for example, using the optional hanging kit. The Compact 2 is Energy Star® rated, in common with all Santa Fe models, and has an Energy Factor of 2.37ltr/kwh which is 30% higher than any 70 pint portable. The Compact 2 is effective in temperatures as low as 49°F (9°C) so is suitable for all but the coldest of basements. The Compact 2 is very popular and is included in my top five for its exceptional technical qualities and the very positive reviews it has received from users. For a larger basement, up to 2200 square feet, the 90 pint Santa Fe Advance would be a better choice. This is larger than the Compact 2, nearly three feet in length, but is powerful for its size. One disadvantage of this unit is its relatively high noise output, 64dB, but it can be set up for ducted operation which allows it to be installed in an enclosure which will reduce the noise nuisance. The energy efficiency of the Advance is even greater than that of the Compact 2 and it boasts an Energy Factor of 2.65ltr/kwh, a gain of 12%. The lowest operating temperature of the Advance is 56°F (13°C), a little higher than that of the Compact but still sufficient for the majority of cooler basements. The Advance is as popular as the Compact 2 and is included in the top 5 because of the exceptionally positive reviews by users with an almost perfect "five star" rating. It is even more powerful than the Advance and its 105 pints per day water removal rate allows it to control humidity in basements as large as 2500 square feet. The Impact can be installed with ducting if required which will improve its performance across a large, open basement or allow the unit to control humidity throughout several smaller partitioned areas if needed. The minimum temperature in which the Impact is effective is 56°F (13°C) which makes it suitable for most basements. The most impressive feature of the Impact is its exceptional energy efficiency. This appliance has the extraordinary Energy Factor of 4.2ltr/kwh which makes it more energy efficient than any other large capacity model sold in the USA for residential use. It is this very high level of energy efficiency that has led me to include this model among my top five basement dehumidifiers, despite the lack of user reviews of this very recent addition to the Santa Fe range. The Ebac RM65 is a commercial model designed specifically for water damage restoration. One of the features included with the RM65 is a heavy duty internal condensate pump, a necessity for restoration work. The RM65 is a new model, introduced this year, with a water extraction capacity of 80 pints per day, enough for a basement of around 1800 square feet. This unit has a strong roto-molded casing, is relatively light and compact for its power and has a similar noise output to a 70 pint portable. It has two large wheels and a retractable handle so is easily movable around your basement. The main advantage this unit offers when compared with the Santa Fe models is its lower minimum operating temperature of 41°F (5°C). For some of you even the Santa Fe basement models will be unsuitable if your basement is very cold and this unit may provide the answer. Despite the lack of a track record for this unit I have included it in my top five because of its high water removal capacity, its low temperature operating capability and, most importantly, its affordability. The RM65 will cost no more than the Santa Fe Advance which makes it exceptional value for money. If your basement is even colder, too cold for the Ebac RM65, the alternative is the Dri-Eaz DrizAir 1200, another water damage restoration unit. The DrizAir 1200 is similar in size, weight and general configuration to the RM65 but has an even lower minimum operating temperature of 33°F (1°C). No refrigerant unit can operate at temperatures below the freezing point of water so this is as good as it gets! The DrizAir 1200 has a water extraction capacity of 64 pints per day so if your basement is larger than around 1400 square feet you would need a more powerful and much more expensive appliance but for the average basement this model is entirely adequate. Like the RM65 the DrizAir 1200 provides the convenience of an internal condensate pump, large wheels and a handle and a strong roto-molded casing to protect both the machine and your possessions from accidental impacts. I have included the DrizAir 1200 in my top 5 because it has received positive user reviews, for its low temperature operating capability and its affordability. 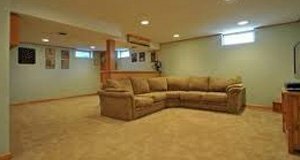 If you are looking for a portable for your basement you may like to visit this page where I make my selection of the top 5 portables sold in the USA.